Sharks have inhabited our oceans for hundreds of millions of years, and a single shark can replace tens of thousands of teeth over its lifetime. 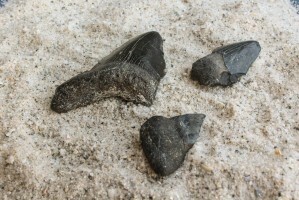 Today, fossilized shark teeth help scientists understand these ancient fishes, including the extinct megalodon, the largest shark known to science! 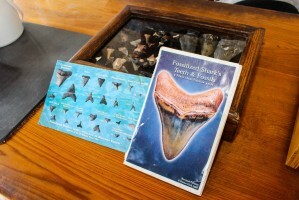 At Fossil Creek, located near the stingray touch pool in Mote Aquarium’s courtyard, guests can play marine paleontologist by purchasing a container of sand and sifting out real, fossilized shark teeth estimated to be millions or tens of millions of years old. Teeth may come from tiger, hammerhead, great white, mako and other shark species still alive today — and with luck, maybe even the coveted megalodon! Guests may also find stingray barbs smoothed with time, bony plates from pufferfish mouths and more. All fossils are real and are yours to keep. Like shark teeth? Wait ‘til you see this: Beside Fossil Creek, check out our replica of a huge megalodon jaw! Come as close as you dare — to take a great photo! This ancient predator could reach 60 feet long according to some estimates. Megalodon swam the ancient oceans for 15 million years, disappearing by about two million years ago.